Energy and water consumption, recycling, awareness of local cultures, sustainability, economy and saving of resources: few but important imperatives that affect our daily life both as citizens and professionals. Since the beginning of the 2000s it has been impossible for architects, designers and artists not to wholeheartedly dedicate themselves to social imperatives due to the global order rising on a global level. They search for the legitimation of their work and for activities that are relevant to the society’s fundamental needs. This legitimation is connected with parameters that move outside the existing confines of the formal and the aesthetical towards the ethical. Sacrifice of authorship in the name of bottom-up design and true collaboration is overtaking the genius creator as bearer of insights. Collective action towards the recovery of a social bond is now an imperative. Process is overtaking end-result, and form is being relegated. The objective of the Ethics / Aesthetics is to explore the moral values related to territorial practices and to communicate the conclusions to the public. 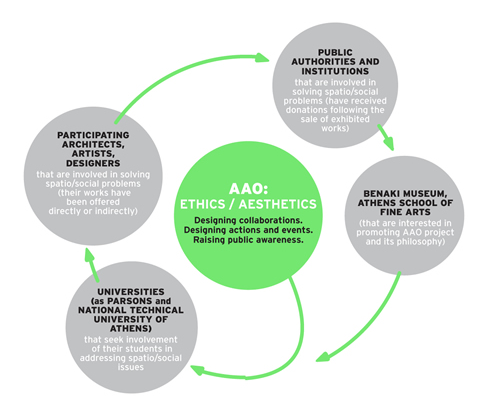 In particular, Ethics / Aesthetics aims to promote the current social dimension of Architecture through the expansive analogies with Design and Art; and by enhancing the field of Architecture, to suggest solutions on social and ecological issues – both in relation to public space and the improvement of everyday life. Moreover, Ethics / Aesthetics is a platform through which architecture, design and art can initiate a democratic and productive dialogue on crucial issues that concern all citizens and their quality of life as this is manifested in public space. Finally, an additional objective of Ethics / Aesthetics is to explore the impact of these new participatory processes on the field of spatial practices and on the creation of new evaluation criteria, as well as the need for the existence of such criteria. These issues are posed through the way the main exhibition is structured. In addition, during the first Conference, speakers will explore the spatial translations of ethics and aesthetics and the critical role of new spatial practices within the current social, political and environmental context. By categorizing works according to their aesthetical and/or ethical concern, Ethics/Aesthetics aims at creating a platform of discussion on the issue of evaluation criteria. It thus presents works that negotiate ethics and aesthetics, or promote the one at the expense of the other. In Activism. Groups with Vision formal aspects become relegated in favor of discursive exchange and negotiation. In Society & Aesthetics works immobilize innovative strategies for addressing urban, social, environmental issues and at the same time keep a distinctive aesthetic language. Here prevails the belief that design is never neutral –beauty, function and ethics are not disconnected– or else, new practices develop new forms of aesthetics and, according to Rancière, the aesthetic already contains an ameliorative assurance. In works of Identity. Commercial Ethics aesthetics symbolize an ethical stance, and works of Action – Reaction! utterly eschew political correctness and adopt a reactionary to the (consumer) society attitude, negation of the expected, and discomfort that is close to the Dadaist tradition. Can Αrchitecture effectively challenge and/or change social organization? Opposition to the prevailing sociopolitical order is a common denominator among many works. However, in a certain way, it is precisely the global macro-structures of the capitalist way of production that provoke micro-structural resistances – that is, forms of self-organization on the social, technological, and cultural levels. At the same time, these ‘deviations’ materialize and articulate themselves on the very matrix of capitalism and draw their entire material from this world. Between the macro-level of existing powers and hegemonies on one side and forms of self-organization, there is a constant exchange of means of production and investments, which do not have the same origin, but are still intertwined so closely as to have become indistinguishable. This makes all retrospective political reference so difficult and eventually turns it into a complicated archaeological and genealogical task of reading semiotic and material traces, which again lead to other traces. In the main exhibition, a number of activists have chosen to employ a corporate hierarchy in their group and others a communication language that borrows its beat from the mass media. Other teams have chosen the prevailing art system, including gallery spaces, for the dissemination of their works. Some creators have chosen a marketable yet socially and environmentally responsible brand method to enhance their profile. Some works stay at the margins of the market-driven production and remain in small commissions, in snatches or in early phases of their designers’ paths. How does Ethics / Aesthetics act? The interaction between ethics and aesthetics unfolds in series of events reflecting an interdisciplinary approach: exhibitions, two cross-disciplinary conferences, workshops and various other performance-actions employ diverse cooperative groups consisting of specialists in their field (architects, designers and artists) who act collectively with a view to find solutions to imminent social and environmental issues.